The RMAA assists abattoirs with increasing profits, safety and quality while reducing losses. This is achieved by evaluation and identification of non-compliances, corrective training and recommendations regarding various aspects. 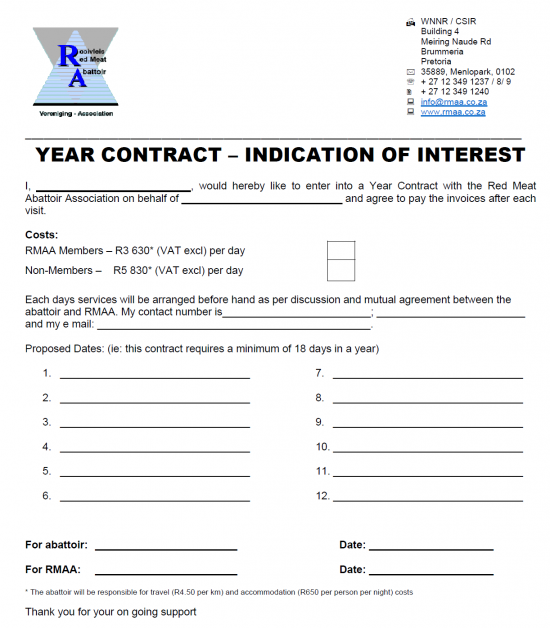 RMAA Services include the following aspects but abattoirs may request support in terms of their own requirements. The custom-made contracts can be prolonged if needed to suit individual requirements. Slaughter Technique Training: Slaughter personnel are trained practically at each slaughter station. The training report forms part of the HMP for slaughter and dressing as well as for evidence of training conducted. Hygiene Awareness Training (Non-Seta): Personal Hygiene Training is a regulatory requirement. Personnel already trained also needs refresher courses in order to consistently comply with requirements. Animal Handling Evaluation & Training: Animal Handling Training is a regulatory requirement. Inhumane animal handling leads to bruises, injuries, carcass weight loss, spread of contamination, short shelf life and a poor quality product. Training is conducted theoretically but mostly practically from lairages to bleeding. Food Safety Management System (HACCP) Awareness: Workers are equipped with a basic understanding of Food Safety Management Systems and the necessity of correct recordings. Food safety principles, HMS, Monitoring, Control of CCP’s and Corrective Action Procedures are covered. HMS GAP Evaluation: HMS GAP evaluation is conducted to identify shortcomings into Meat Safety Regulations and a detailed report is provided. HMS (Food Safety Management System) Support: Assistance is provided with compilation of procedures and records and updating of existing systems. Line layout: It is important to ensure that the workload is spread evenly on the slaughter line and that it runs at an even speed without bottle-neck situations which lead to loss of production time, exhaustion of some workers and ineffective use of others. Re-distribution of functions on the line is suggested to ensure optimal use of each worker. Carcass Yield: Reasons for loss of carcass weight is investigated. Training or other corrective actions are then implemented. Hide & Skin Damage: Hide and skin damage is investigated and corrective training or other corrective actions implemented to prevent these. Offal Handling: Often the operators in these areas are neglected in terms of training. The training is aimed at improving the offal handling environment. Equipment Evaluation: Improperly maintained equipment may lead to contamination, damage, wastage, unsafe situations, inhumane animal handling, losses, additional expenditure, regulatory non-compliance, poor audit results, pest infestations, difficulty in cleaning and sanitation etc. Training is conducted in the correct handling of the equipment and defects pointed out in a detailed report. Management Tools for Better Control: (Stock control, Deepbone temperature control, Dispatch control, Incidences, Personnel attendance, Down time). Documentation which may enhance better management is discussed and provided to the supervisor/ manager.